Surprise! We'll be having one last big moving sale before we move to our new location! Everything we sell is something we don't have to pack and move, so we're very motivated. We're offering 15% or more off EVERYTHING in stock, with additional special bargains! And, if you see something you want, make us an offer! We've never done a sale of this scale, so come on by and find yourself a new bike, stock up on bike part and accessories, and help us get ready for our big move! ¡Sorpresa! ¡Vamos a tener una última gran venta de mudanza antes de mudarnos a nuestra nueva ubicación! Todo lo que vendemos es algo que no tendremos que empacar y mover, así que estamos muy motivados a vender. Estamos ofreciendo descuento de 15% o más de TODO en stock, con gangas especiales adicionales! Y, si ves algo que quieres, haznos una oferta! Nunca hemos hecho una venta de esta escala, así que venga y busque una nueva bici, compre piezas y accesorios para bicicletas y ayúdanos a prepararnos para nuestro gran movimiento. We're having another one of our thrilling Used Bike Sales, except this time even bigger! This time, we're preparing for our upcoming move (details to be announced very soon!) and we're selling bikes and parks even cheaper than usual to clear out the shop. In addition to a wide array of discounted bikes starting as low as $5, we'll have both new and used parts for sale for at least 20% off (items in stock at shop only). Get there early for the best deals! The shop will also be open during the sale for you to customize and/or fix up your new ride. Flier by volunteer Cindy, aka @pruneyfingers! Preview of some of the bikes for tomorrow's Used Bike Sale! These are just a few of the bikes you can expect to find for sale at ridiculously low prices at tomorrow's Used Bike Sale! Prices: so cheap! 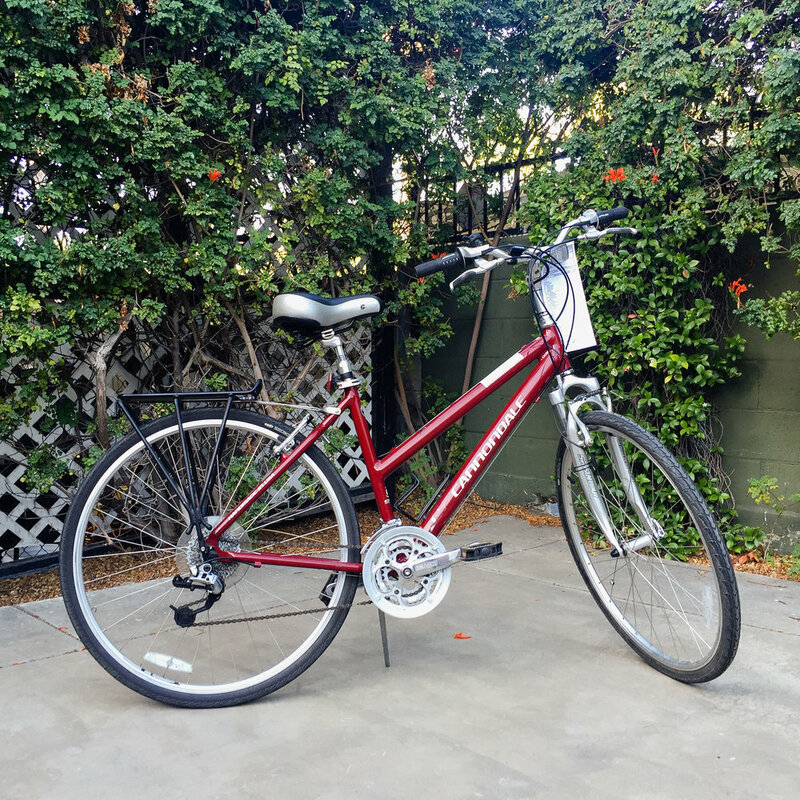 Bikes as cheap as $5! 10th Anniversary party for The Bicycle Tree — food, vendors, and LIVE MUSIC!!! The Bicycle Tree turns ten years old this year! To celebrate, we are teaming up with SolArt Radio for a day of live music, food, and local vendors! This will all take place in the patio and parking lot behind our shop, and entrance is totally FREE thanks to our sponsors. We're amazed by the musicians coming to bring life to the air! KUCI DJ Fifi LaRoux and DJ Calypsso! Message SolArt Radio if you are interested in being a vendor! The Bicycle Tree cumple diez años de edad este año! Para celebrar, estamos haciendo equipo con SolArt Radio para un día de música en vivo, comida y vendedores locales! Todo esto se llevará a cabo en el patio y estacionamiento detrás de nuestra tienda, y la entrada es totalmente gratis, gracias a nuestros patrocinadores! Estamos sorprendidos por los músicos que vienen a traer la vida al aire! También KUCI DJ Fifi Laroux y DJ Calypsso. The Bicycle Tree is always a great place to find a used bike, but it'll be extra good for another bike sale! We'll be bringing in a bunch of bikes right before the sale - more than we can keep in the shop. So there'll be lots of all kinds of bikes to choose from and they'll be priced to move - $5 and up! Come find yourself a new two-wheeled friend! Many bikes will be fully tuned and ready to ride. The shop will also be open for you to customize or fix up your new ride! The sale will be Saturday, May 7th, 8:00 am - 12:00 pm. All proceeds go to benefit The Bicycle Tree, Orange County's only nonprofit community bicycle center. The Bicycle Tree siempre es un gran lugar para encontrar una bicicleta usada, pero será buenísimo para otra venta de bicicletas! Llevaremos un montón de bicicletas justo antes de la venta - más de lo que podemos tener en la tienda. Así que habrá un montón de todo tipo de bicicletas para elegir y que va a tener a un precio para que se vende - $5 y más! Vense para encontrar un nuevo amigo con dos ruedas! Muchas bicicletas estarán totalmente a punto y listas para andar. La tienda también estará abierta para personalizar o arreglar su nuevo viaje. La venta será el sábado, 7 de mayo de 08 a.m. - 12:00 p.m.. Todos los ingresos van a beneficiar The Bicycle Tree, el único centro comunitario de bicicletas sin fines del lucro del Condado de Orange. Don't be invisible. Don't be another statistic. Ride your bike quickly, confidently, and safely after taking FREE Confident Cycling classes with SAAS! Participants receive FREE helmets and quality Cat Eye bike lights, plus invaluable skills to last a lifetime. These classes will be held on many Saturdays and Sundays starting Saturday, April 16th and running through the summer. No sea invisible. No sea una estadística más. Andar en bicicleta de forma rápida, con confianza, y con seguridad después de tomar clases de Andar en Bicicleta con Seguridad GRATIS con SAAS! Los participantes reciben cascos y luces de bicicleta de calidad Cat Eye, además de las habilidades de valor incalculable para toda la vida. Estas clases se llevarán a cabo en muchos sábados y domingos a partir del sábado 16 de abril hasta el verano. 2 Year Anniversary of the Shop! Here in 2016, we celebrated our anniversary with a volunteer party! Our ten year anniversary as an organization is coming up soon. We have only just begun (to party)! It was our honor to take part in Noche de Altares here in Santa Ana, CA, on November 7th, 2015. Our volunteers spent weeks working together to create our altar to commemorate fallen cyclists. We’re dreaming of a Santa Ana where an altar like this wouldn’t be necessary. Note: our friends from Ghost Bike were there as well, and images 7 and 8 are from their altar. The last four images are courtesy of Pam Lee.